Telegraphed a year ago, the Defense Department on Tuesday issued a directive unveiling its altered approach to handling transgender military service members, raising objections from lawmakers and advocacy organizations for LGBTQ people. The new directive signed by acting Deputy Defense Secretary David Norquist allows service by transgender people who can meet the universal standards, but denies “special accommodations” for people with “gender dysphoria,” unless given a waiver. Though current transgender service members are permitted to stay, the plan for the future largely undoes an Obama administration policy allowing transgender people to serve. It is to take effect April 12. Under the Obama administration, Defense Secretary Ash Carter lifted the age-old ban on transgender troops in June 2016. Trump’s first Defense Secretary Jim Mattis produced a report recommending modifications, which was then challenged in the courts. 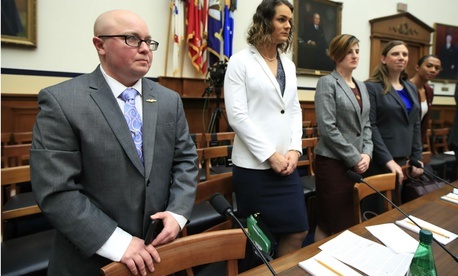 A hearing was held on Feb. 27 by the House Armed Services Subcommittee on Military Personnel at which several transgender service members appeared. He cited legislation (S. 373) introduced with Sens. Kirsten Gillibrand, D-N.Y., and Susan Collins, R-Maine, to protect transgender troops.